AMES, Iowa – A student in the College of Agriculture and Life Sciences at Iowa State University was presented the inaugural George Washington Carver Spirit of Innovation and Service Award on Sept. 20 in St. Louis. Estefany Argueta, a senior majoring in animal ecology, was one of five undergraduate students to receive the award. This is the first year the award was presented as a tribute to the legacy of George Washington Carver, recognizing the efforts of young people striving to achieve their dreams and discovering the relevance in following in the footsteps of Carver — emulating his curiosity about life and nature, his generosity of spirit and his dedication to progress. Carver was an internationally known scientist, inventor, artist and musician born into slavery in Missouri near the end of the Civil War. Carver was the first African American student to be admitted to Iowa State University. He earned his bachelor’s degree in 1894 and his master’s degree in 1896. He was the first African American faculty member at Iowa State. Carver went on to gain an international reputation during a long career at Tuskegee University. The award was sponsored by the George Washington Carver Birthplace Association, which is a nonprofit cooperating association of the National Park Service at the George Washington Carver National Monument at Diamond, Missouri. The award is given to students who are first-generation college students; pursuing a scientific degree; doing well academically, involved in research, engaged in arts and the humanities; and demonstrate a determination and perseverance in pursuing their educational and life goals, which includes an awareness of the natural environment. 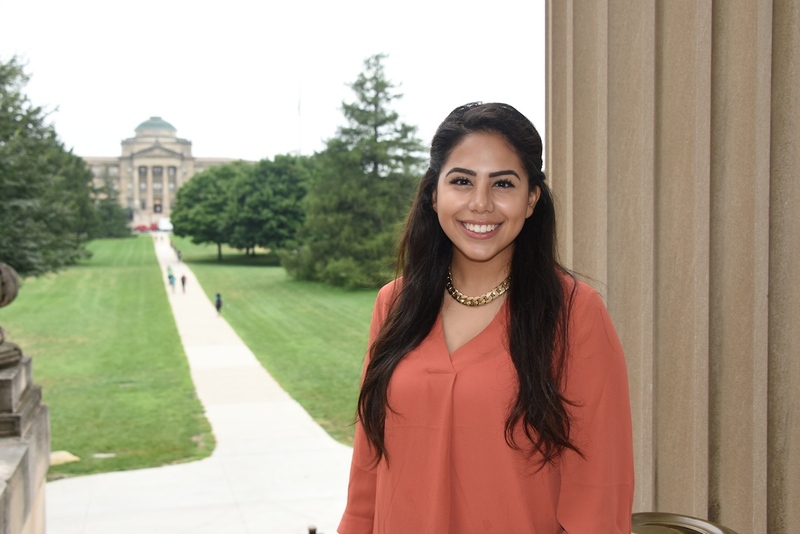 Argueta is an active member of the Iowa State chapter of Minorities in Agriculture and Natural Resources and Related Sciences (MANRRS), and is enrolled in Iowa State's Army Reserve Officer Training Corps (ROTC). After graduation she plans to serve in the military and pursue a career working at an aquarium, zoo or wildlife refuge, or pursuing a career as a park ranger. Argueta credits the Iowa State University Science Bound program for helping her pursue a college education. The program is Iowa State’s premier pre-college program, which encourages Iowa high school students of color to pursue degrees and careers in science technology, engineering and mathematics (STEM) fields. The other four recipients of the Carver Spirit of Innovation and Service Award were: Patresia Payton, an animal science and accounting senior at Tuskegee University; Ishaya David, a biochemistry senior at Simpson College; Jacob Rowell, an environmental science senior at Lincoln University of Missouri; and Adriana Meneses, an animal science and industry junior at Kansas State University. Estefany Argueta, a senior majoring in animal ecology, was one of five undergraduate students to receive the inaugural George Washington Carver Spirit of Innovation and Service Award on Sept. 20 in St. Louis.